It may not be as important as what’s in the glass, but choice of glassware will materially influence the whisky drinking experience. Patrick Leclezio reviews the options. 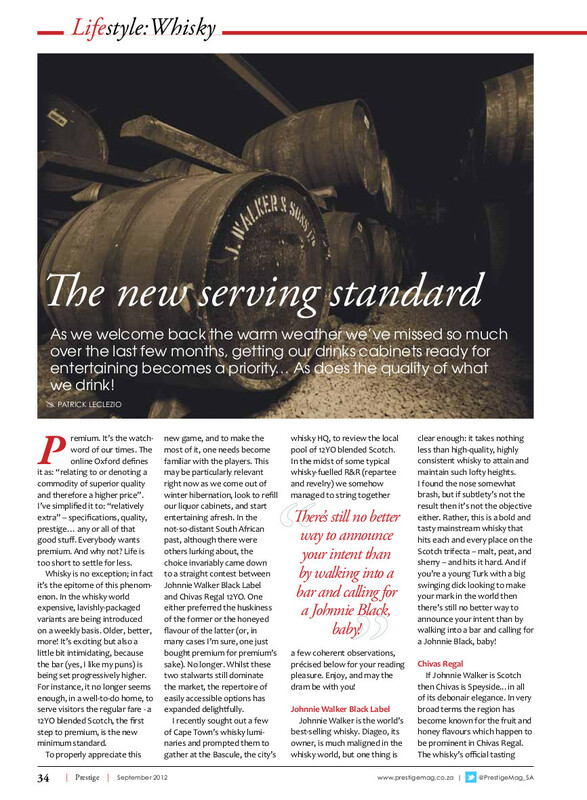 First published in Prestige Magazine (August 2013 edition). If you’re a whisky cowboy riding about out there and exploring the range the weapon that you’re likely to be wielding more than most is a whisky glass. A glass, if you think about it, is as basic as it gets: used for displacing liquid from bottle to mouth. Is this worth worrying about? Surely just about anything will do. Well, actually, no. As with any of a wide array of ordinary, day-to-day products the features that distinguish one type of glass from another make only a subtle difference to its functioning; yet these can be sometimes be enough to both transform our experience of their use, and in many cases to command a substantial premium. I recently assembled a panel of whisky luminaries – seasoned campaigners who’ve drawn just about every which glass from their holsters – to evaluate the various options available to us. Our analysis focused more on casual drinking and less on professional tasting, where the opaque copita is king, but having said that we nonetheless gave due and full recognition to the appreciation of flavour. Some (many) whisky drinkers, much to their disadvantage, often overlook the aroma or nose (to use the proper parlance) of a whisky – which happens to be the most enabling medium through which to best appreciate the finer nuances of flavour, given that there are some 32 primary aromas but only five primary tastes. A good whisky glass should taper inwards towards its rim, concentrating the rising vapours, hence promoting and focusing a person’s ability to savour the nose. Scottish manufacturers Glencairn produce the ideal glass for nosing – a bulbous receptacle at the base graduating into a narrow funnel towards the top; if I’ve had enough to drink I can almost swear that I can see the aromas swirling within it like an inverted tornado. 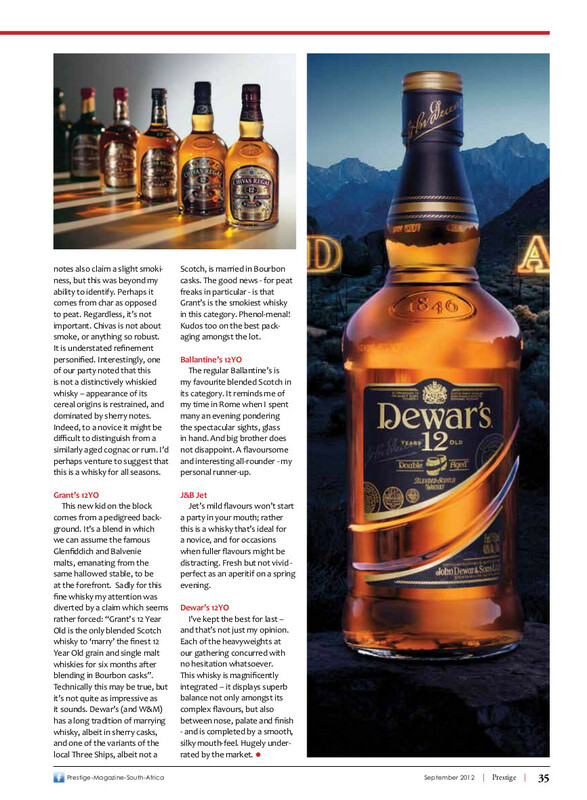 Doubters can employ a simple test to verify the significance of shape: stand a nosing-friendly glass side-by-side with a straight-walled tumbler and add equal measures of the same whisky (in our case we used the delicious Dewar’s 12YO) and water to both. Nose one after the other and repeat – the difference is immediately palpable. There are three factors relating to the rim about which we should be concerned: diameter, thickness and shape. The rim diameter should strike a harmonious balance between being too wide – thereby introducing sufficient area for vapour dispersal – and too narrow – obstructing the transition from nose to palate, especially for those of us with protruding proboscises (i.e. large schnozzes). We found the Libbey 21cl L’Esprit du Vin glass to have the perfect dimensions – the inner rim measuring 45mm. In terms of thickness there’s also a middle ground where drinking comfort becomes optimal, but this may be a matter of personal taste. We tested a set of Normann Copenhagen rocking glasses whose chunky and cumbersome rims were almost suggestive of drinking out of a bowl. Conversely the Glencairns are just too thin, too fine…whisky drinking requires a certain robust masculinity after all. Lastly the shape of the rim can substantially enhance the experience of glass on lip, and subsequently of the introduction of the whisky into the mouth. Riedel’s Vinum Single Malt glass is magnificent in this respect – a flared rim allows the whisky to pool at the lips before cascading over the teeth and onto the palate. 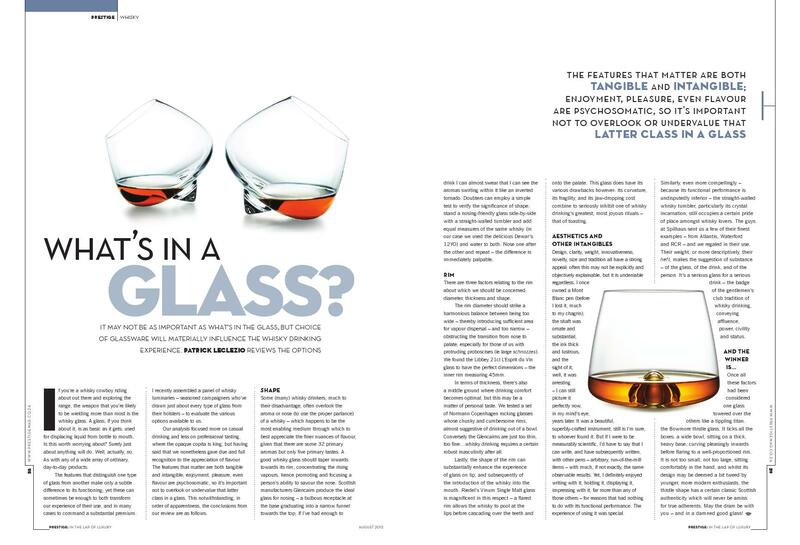 This glass does have its various drawbacks however: its curvature, its fragility, and its jaw-dropping cost combine to seriously inhibit one of whisky drinking’s greatest, most joyous rituals – that of toasting. Design, clarity, weight, innovativeness, novelty, size and tradition all have a strong appeal; often this may not be explicitly and objectively explainable, but it is undeniable regardless. I once owned a Mont Blanc pen (before I lost it, much to my chagrin); the shaft was ornate and substantial, the ink thick and lustrous, and the sight of it, well, it was arresting – I can still picture it perfectly now, in my mind’s eye, years later. It was a beautiful, superbly-crafted instrument; still is I’m sure, to whoever found it. But if I were to be measurably scientific, I’d have to say that I can write, and have subsequently written, with other pens – arbitrary, run-of-the-mill items – with much, if not exactly, the same observable results. Yet, I definitely enjoyed writing with it, holding it, displaying it, impressing with it, far more than any of those others – for reasons that had nothing to do with its functional performance. The experience of using it was special. Similarly, even more compellingly – because its functional performance is undisputedly inferior – the straight-walled whisky tumbler, particularly its crystal incarnation, still occupies a certain pride of place amongst whisky lovers. The guys at Spilhaus sent us a few of their finest examples – from Atlantis, Waterford and RCR – and we regaled in their use. Their weight, or more descriptively, their heft, makes the suggestion of substance – of the glass, of the drink, and of the person. It’s a serious glass for a serious drink – the badge of the gentlemen’s club tradition of whisky drinking, conveying affluence, power, civility and status. Once all these factors had been considered one glass towered above the others like a tippling titan: the Bowmore thistle glass. It ticks all the boxes: a wide bowl, sitting on a thick, heavy base, curving pleasingly inwards before flaring to a well-proportioned rim. It is not too small, not too large, sitting comfortably in the hand, and whilst its design may be deemed a bit tweed by younger, more modern enthusiasts, the thistle shape has a certain classic Scottish authenticity that will never be amiss for true adherents. 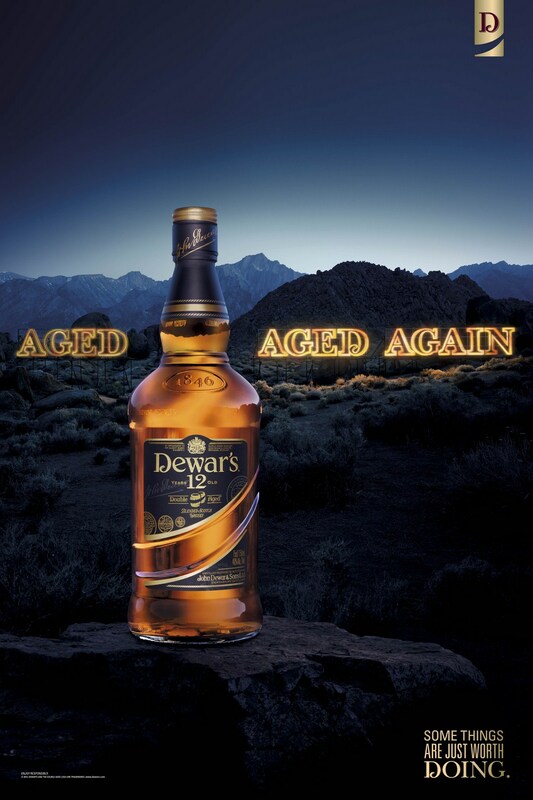 May the dram be with you – and in a damned good glass at that! Special thanks to Bernardo Gutman, Marsh Middleton, and Hector McBeth.